I saw this unit at Leisureland Homes off Oakville Road. How would that be as an accessory dwelling? The Albany City Council gets another chance this week to pass a code change to allow detached “accessory dwelling units” — essentially small second houses –on all single-family residential lots in line with a state mandate. Mayor Sharon Konopa and a four-member council majority have been at odds on the issue. The four want to allow bigger units with few restrictions such as parking and ownership requirements. The mayor fears this could destroy the character of traditional single-family neighborhoods and create problems with on-street parking. She has used her veto power to block a code change the four voted to pass. The current code allows so-called detached ADUs as big as half the main residence, up to 750 square feet, in some but not all single-family zones. The change blocked by the mayor, which had been approved by the planning commission, would allow units up to 900 square feet. The other day I saw a grand-looking little house on wheels on the lot of Leisureland Homes at Highway 34 and Oakville Road. I wondered if that sort of dwelling could be set up as an ADU, and the answer appears to be yes. Imagine that, there could be another solution!! When a problem-solving group locked up, I’d occasionally pull out a nickel (other coins work, but less dependably) stand it onedge, and tell them to find the third solution. 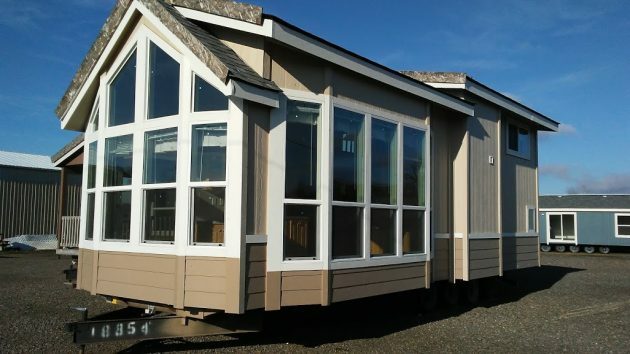 What makes “a grand-looking little house” (whether or not it’s on wheels)? Having two (seemingly three, I’m not sure) different roof angles? Having sides that bulge out but not enough to serve as bay windows? Maybe I’m just an old crank, but what I see is a micro version of what I complained about on the recent “cheese grater” article. Nevertheless, if this is what it takes to move the housing industry off its “one (too big) size fits everybody” attitude, then I’m all for it. But it’s ok for people to live in 5th Wheels & Trailer’s on the side of homes, backyards and even some front yards & streets. Counterpoint: Not every life-building 26-year-old has ready access to medical insurance under our health-care system, irrespective of where they live relative to their parents. At 26 my daughter had a bachelor’s and master’s and was halfway to her Ph.D. — 1,200 miles from here. It didn’t seem like such a bad thing that she still qualified to be on a parent’s policy. to Lundy–perhaps the choice of Bach/Masters and PhD subjects could have been a better one. Even part time work can pay for essentials. Lots of folks get degrees with no/insufficient economic benefits for future independence. Why do we allow state mandates? I am so glad that Mrs. Mayor can not tell me what to do on my farm in N. Albany. It seems many are dedicated to the well worn trope, “there goes the neighborhood,” where ADUs are concerned. After analyzing Linn County and Albany voter preferences, this resistance to Granny Shacks seems consistent with local baditudes. But first, a bit of etymology on that old adage. We’ll take your n+××÷=s or your c! @#$s, but not your Irish. Many folks react negatively when presented with something out of their experience, even if implementation hasn’t happened. Larry — Are you sure?